The transportation and warehousing sector and related industries employ over 13.0 million people in a variety of roles, from driving buses to manufacturing cars to building and maintaining ports and railroads (box 4-1). This chapter explores transportation employment by industry, occupation, mode, and state, and highlights the significant role that transportation employment plays in the Nation’s job profile. Source: U.S. Department of Transportation, Bureau of Transportation Statistics, 2017. Figure 4-1 shows the number and percent of workers in transportation and transportation-related industries from 1990 to 2016. “Transportation-related industries” includes all industries in the transportation and warehousing sector (e.g., air, rail, water, and truck transportation), as well as related industries like motor vehicle parts manufacturing. In 1990, 12.3 million workers were employed in these industries. Employment rose to a high of 13.9 million workers in 2000 but declined to 13.2 million by 2003 following the 2001 recession. Employment declined further to a low of 12.1 million in 2010 due to the 2007 to 2009 recession. Employment rose steadily from 2011 to 2015, reaching 13.6 million in 2015 and exceeding the pre-recession level of 13.5 million in 2007 for the first time. In 2016, employment declined to 13.0 million. Employment increased for industries in the transportation and warehousing sector, but this increase was more than offset by a decline in employment for transportation-related industries. The percentage of American workers in transportation-related employment has continued to decline from 11.3 percent in 1990 to 9.0 percent in 2016. Source: U.S. Department of Transportation, Bureau of Transportation Statistics, National Transportation Statistics, table 3-23, available at www.bts.gov. The for-hire transportation and warehousing sector (NAICS 48-49; box 4-2) directly employed 5.0 million workers in the United States in 2016—3.5 percent of the Nation’s total labor force. Employment in this sector includes both transportation and non-transportation occupations, and covers a diverse set of skills. Figure 4-2 shows for-hire transportation and warehousing employment from 1990 to 2016 by subsector (box 4-3). Each subsector shows different patterns of employment because they have different mixes of job skills and occupations, as well as different economic environments. Truck transportation is the largest subsector, employing 29.2 percent of the 4.9 million for-hire transportation employees in 2016. Truck transportation employment grew by 29.5 percent between 1990 and 2016, from 1.1 million to 1.5 million employees, with significant fluctuations related to major economic events such as September 11, 2001, the Great Recession, and other economic recessions. Warehousing and storage employment grew by 125.1 percent, from 406,600 to 915,100 employees, to become the second-largest subsector, overtaking air transportation in 2004. The “support activities for transportation” subsector (which includes establishments like air traffic control services, marine cargo handling, and motor vehicle towing) is the third-largest subsector, growing 81.3 percent from 364,100 to 660,100 employees from 1990 to 2016. For-hire transportation consists of transportation services provided on a fee basis to industries and the public. These services are provided by businesses such as railroads, transit agencies, common-carrier trucking providers, airlines, and pipeline companies. In-house transportation consists of the services provided by non-transportation industries for their own use. It includes privately owned and operated vehicles used primarily on public rights of way, as well as the supportive services to store, maintain, and operate those vehicles. Not all for-hire transportation subsectors experienced employment increases from 1990 to 2016. Employment in air transportation increased from 1995 to 2001, but declined after 2001, leading to an overall decrease in employment of 13.3 percent between 1990 and 2016, from 529,200 to 458,600 employees. In addition, rail transportation employment declined by 21.0 percent from 1990 to 2016 (from 271,800 to 214,700 employees) and pipeline transportation employment declined 17.2 percent from 1990 to 2016 (from 59,800 to 49,500 employees). The transportation and warehousing sector (North American Industrial Classification System (NAICS 48-49) includes air transportation, water transportation, truck transportation, transit and ground passenger transportation, pipeline transportation, scenic and sightseeing transportation, support activities for transportation (e.g., air traffic control and marine cargo handling), postal service, couriers and messengers, and warehousing and storage. It does not include government, railroad transportation, or self-employed persons. Air transportation (NAICS 481) includes industries providing air transportation of passengers and cargo using aircraft, such as airplanes and helicopters. It does not include scenic and sightseeing air transportation, support activities for air transportation, or air courier services. Water transportation (NAICS 483) includes industries providing water transportation of passengers and cargo using water craft, such as ships, barges, and boats. It does not include scenic and sightseeing water transportation services or support activities for water transportation. Truck transportation (NAICS 484) includes industries providing over-the-road transportation of cargo using motor vehicles, such as trucks and tractor trailers. It does not include support activities for road transportation, freight transportation arrangement services, the Postal Service (covered in NAICS 491), or courier services. Transit and ground passenger transportation (NAICS 485) includes industries providing a variety of passenger transportation activities, such as urban transit systems; chartered bus, school bus, and interurban bus transportation; and taxis. It does not include scenic and sightseeing transportation, support activities for road transportation, or arrangement for car pools and vanpools. Pipeline transportation (NAICS 486) includes industries using transmission pipelines to transport products, such as crude oil, natural gas, refined petroleum products, and slurry. It does not include activities classified as utilities, such as natural gas distribution or water and air distribution and collection. Transportation also leads to employment in related industries that provide the goods and services needed to produce transportation. For example, transportation companies purchase transportation equipment (as do other companies engaged in in-house transportation), motor vehicle dealers and gas stations provide services that support household and business transportation, and a significant portion of the output of the petroleum industry is used for transportation. A notable shift in transportation-related employment occurred between 1990 and 2016. From 1990 through 2001, transportation equipment manufacturing was the largest transportation-related industry (figure 4-3). However, as employment in transportation equipment manufacturing experienced a prolonged decline, motor vehicle and parts dealers became the largest industry in 2002. Employment in motor vehicle and parts dealers grew by 32.6 percent from 1990 to 2016, while employment in transportation equipment manufacturing declined 23.9 percent. Many workers in transportation-related jobs are not included in employment data for transportation industries because they work for non-transportation firms. Table 4-1 highlights the variety of positions available in various industries using the Standard Occupational Classification (SOC) system. 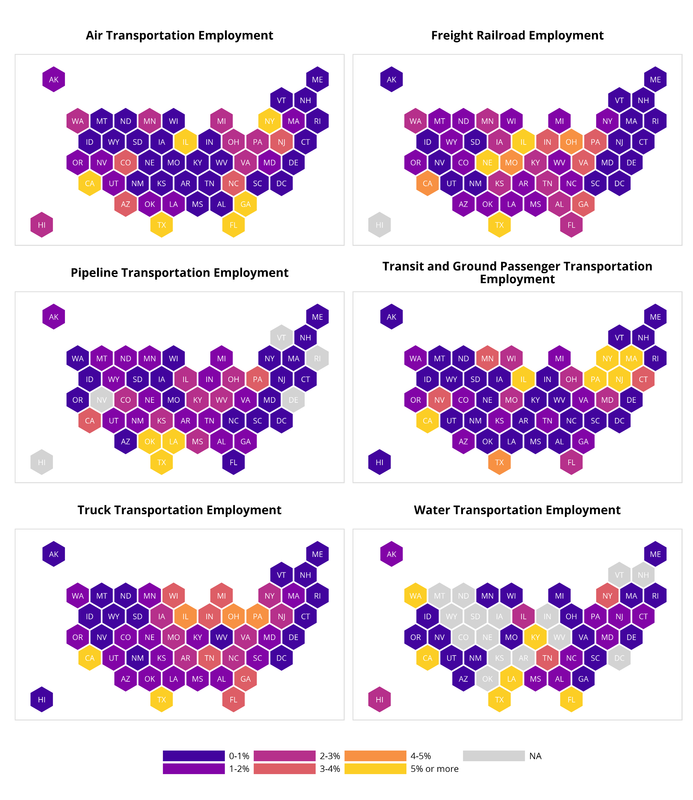 Understanding the full range of transportation jobs and skills in the economy requires examination of employment data at the occupational level. From 2000 to 2016, employment in transportation and transportation-related occupations decreased by 1.1 percent. Some of the declines in employment are likely due to the December 2007 to June 2009 recession, but other declines in employment—for example, declines for postal service mail carriers and for couriers and messengers—portend structural changes in transportation employment. Many employees of transportation companies, such as accountants and computer programmers, work in occupations that are not considered transportation occupations. Conversely, many workers in transportation occupations are employed in other industries, such as truck drivers working for retail chains. Figure 4-4 illustrates this difference using employment estimates produced by the Bureau of Labor Statistics (BLS) for the Occupational Employment Statistics program (box 4-4). While total employment in the transportation and warehousing sector and total employment in transportation occupations measure the role of transportation in employment, they are different measures and may not move in tandem. Note: Totals may differ from other totals in chapter because occupational statistics available at the sector level differ from occupational statistics available at the national level. Source: Bureau of Labor Statistics, Occupational Employment Statistics, available at bls.gov/oes. The Bureau of Labor Statistics (BLS) produces annual occupational employment and wage estimates as part of the Occupational Employment Statistics (OES) program. BLS conducts a semi-annual survey of establishments to produce estimates for over 800 industries in the United States. The survey covers all full-time and part-time paid workers in non-farm industries, but does not include the self-employed or unpaid workers. The occupations were selected based on a broad definition of transportation and transportation-related occupations found in Sen, B. and M. Rossetti, "A Complete Count of the U.S. Transportation Workforce," Transportation Research Record 1719: 2000, pp 259–266. BTS compiles statistics for a group of transportation and transportation-related occupations in National Transportation Statistics, which includes occupations in the SOC "transportation and material moving" occupation group. The percentage of workers employed part-time in transportation and material moving occupations is slightly lower than the percentage of workers employed part-time in all occupations as a whole (figure 4-5). The percentage of part-time workers in transportation and material moving occupations increased from a low of 20.3 percent in 2006 to a high of 27.2 percent in 2009 due to the 2007 to 2009 economic recession but has decreased to 22.9 percent as of 2016. Source: Bureau of Labor Statistics, Current Population Survey, available at www.census.gov/programs-surveys/cps.html. Figure 4-6 compares compensation for workers in transportation and material moving occupations and workers in all occupations from 2004 to 2017. Compensation includes wages and benefits. In current dollars, compensation for workers in transportation and material moving occupations increased 46.6 percent from the first quarter of 2004 to the first quarter of 2017 (from $19.74 to $28.93). In comparison, wages for all occupations increased 41.4 percent (from $24.95 to $35.28). 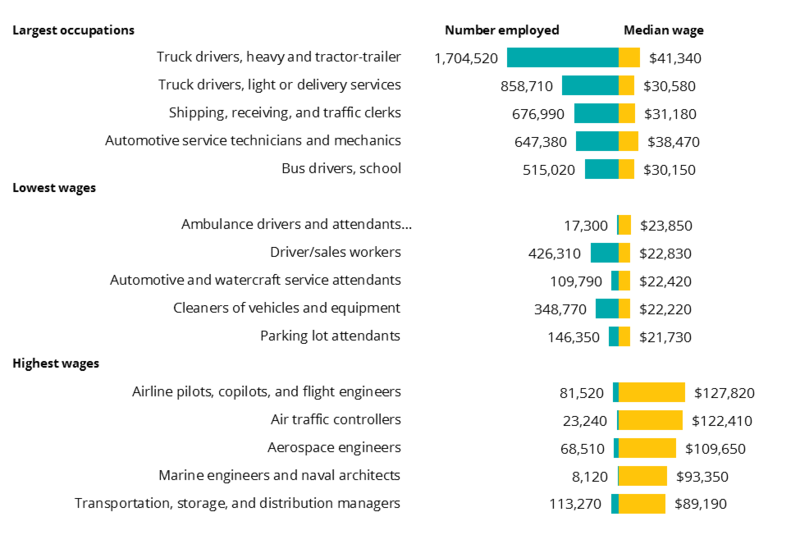 Low-wage transportation occupations, like truck drivers and household movers, account for a much larger share of the transportation workforce than high-wage occupations like airline pilots. As a result, the average compensation for transportation-related occupations is $6.35 dollars per hour less than the average for all occupations as of the first quarter of 2017. Source: U.S. Department of Labor, Bureau of Labor Statistics, Employer Costs for Employee Compensation, available at www.bls.gov/ncs/ect/#tables. Figure 4-7 illustrates annual wages for the largest, lowest-paid, and highest-paid transportation occupations in the United States in 2016. Because some occupations are more seasonal, analysts use annual wage data instead of the average hourly compensation used in figure 4-6 to compare industry employment categories. Annual wages vary widely, from an average of over $100,000 for airline pilots to an average of $21,730 for parking lot attendants. The five lowest-paid transportation-related occupations collectively employ 1.0 million workers, while the five highest-paid occupations employ 294,660 workers. BTS compiles employment and financial data submitted by airlines to provide a detailed picture of airline labor. In 2016, approximately 282,000 employees worked in aircraft and traffic handling—for example, as baggage handlers, as flight dispatchers, or as reservations clerks. Approximately 82,000 employees worked as in-flight personnel (including pilots), 51,000 worked in maintenance, 11,000 worked in general management, and 204,000 worked in other occupations. Source: U.S. Department of Labor, Bureau of Labor Statistics, Occupational Employment and Wages, available at www.bls.gov/oes. Figure 4-8 uses airline data to show trends in average annual salaries for airline labor, adjusted for inflation. Salaries for in-flight personnel experienced the largest absolute growth, increasing by 53.7 percent from $158,236 in 2005 to $243,187 in 2016. Salaries for employees in “other aviation occupations” experienced the largest relative growth, increasing by 83.2 percent from $21,170 to $38,789 in the same period. Salaries rose for all groups except general management, whose salaries declined 39.9 percent from their peak of $144,784 in 2006 to $86,962 in 2016. Sources: U.S. Department of Transportation, Bureau of Transportation Statistics, Office of Airline Information, Form 42 Schedule P-6 and P-10, available at transtats.bts.gov. Transportation establishments and firms employ people throughout the United States.1 Figure 4-9 shows the relative share of employees in each state in 2016, and table 4-2 shows information about transportation establishments, employees, and total employee payroll for each state. Self-employed workers, freight railroad employees, and government employees are not included. State transportation employment is highly related to population and locations of transportation hubs. The five most populated states—California, Texas, Florida, New York, and Illinois—have the greatest number of establishments and employees, both because they have a large employment pool and because they have national large transportation hubs like railroad interchanges or major ports. Transportation establishments collectively account for 3.7 percent of total employees and 3.6 percent of total payroll in the United States. Transportation establishments employ anywhere from 0.6 percent of total state employees in the District of Columbia to 7.0 percent of employees in Alaska. Accordingly, the share of total state payroll ranges from 0.6 percent in the District of Columbia to 8.7 percent in Alaska. Many transportation establishments are small businesses: the national average establishment size is 20 employees. Source: U.S. Department of Transportation, Bureau of Transportation Statistics, State Transportation Statistics, table 6-1, available at www.bts.gov. 1 BLS defines an establishment as a single location where one predominant activity occurs, and a firm as an establishment or a combination of establishments. Figure 4-10 illustrates the state distribution of modal employment. While transportation employment remains related to population, there is some variation by mode. For example, Texas, Louisiana, and Oklahoma have the largest number of pipeline establishments, even though Louisiana and Oklahoma are the 25th and 28th most populated states. In contrast, while Florida is the third most populated state, it has few pipeline establishments and ranks 31st. For freight railroad, Nebraska has the third largest number of employees, despite being the 37th most populated state, because it contains the headquarters of a major railroad corporation. 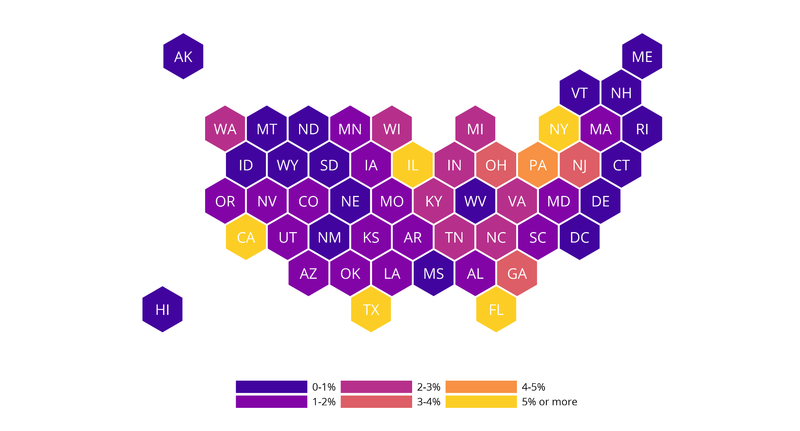 Note: Data for states in light gray were withheld to prevent disclosure. Source: U.S. Department of Transportation, Bureau of Transportation Statistics, State Transportation Statistics, tables 6-2 to 6-7, available at www.bts.gov.